TAIZHOU, China- There is a scrumptious layer of gray muck spread liberally over the once white (I’m guessing) tiled floor, there is the salty mucus of instant raman noodle flavoring petrified in mid drip down the kitchen cabinet doors, there is an entourage of biodegrading vegetables and in the refrigerator, and hundreds of sucked on and spit out peanut shells and cigarette butts are in a large bowel on the floor of a bedroom. My family and I are moving into an apartment in China, and the previous occupants left it totally disgusting to the complete disregard of the landlady. Cleaning it will be our job alone. This is a custom of China: apartments are apparently cleaned by the tenants moving in, not the ones moving out. Do not be scared off by an apartment in this country just because it is filthy. Try to look past the dirt, gunk, grime, and muck and see the place in it’s virgin state — then move in and clean, clean, clean. My family and I were shown three or four different apartments around Taizhou that we had the choice of staying in. My wife’s employer, around five of her co-workers, and the landlords accompanied us on this voyage. 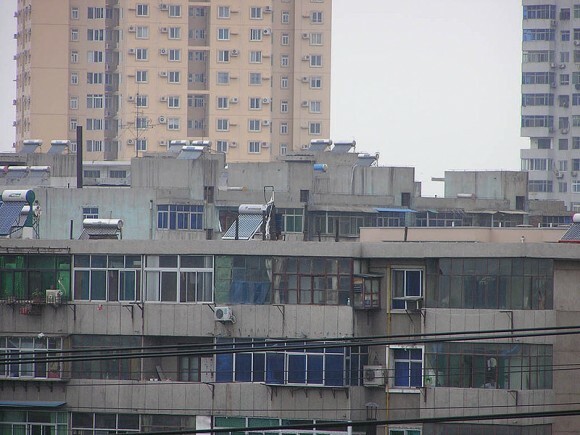 All the people that were with us were crisp, clean, and bonafide members of China’s middle and upper class, but there was not a single reaction or peep out of anyone about the varying lack of cleanliness of any apartment we inspected. They simply stepped over the junk as though it did not exist, showed us refrigerators full of rotten food as though it was part of the display, and touched even the dirtiest of objects as though it was how they came at the store. Was this a matter of face? Or were grubby apartments a way of course here — so normal that nobody even noticed it? It was probably a little of both, but, to be sure, each time I’ve moved into an apartment in China in the past it has been an experience in Tyvek suit cleaning. This is the third apartment that I’ve rented in China — so I knew what to expect when coming to Taizhou. All of the apartments that we were shown were far cleaner than any of my previous two in Hangzhou. In fact, I breathed a sigh of relief with each apartment we were offered. My first Chinese apartment was unfortunately carpeted. After years upon years of not being vacuumed or cleaned there was a mat human head and body hair that nearly completely covered it. You could tell where the previous residents spent the most of their time by the thickness of the hair mat in various parts of the apartment. To accompany this, two large splotches of the previous occupant’s dried puke were splattered over the carpet and walls of two different rooms. While my second apartment in China was covered with black soot on all surfaces that were not regularly touched. The apartment that we chose in Taizhou was not nearly so bad. My wife then made her way to the moldy vegetables in the refrigerator. My reassurances fell way flat as she began to cry. My poor wife is new to China, she doesn’t yet understand that what she is experiencing is normal. She cried and cried: “This place is f’cking disgusting.” I couldn’t really argue with her, but I could say that I’ve seen worse. Way worse. A friend just told me about how there was a thick layer of dried and encrusted cooking oil covering his kitchen floor which he had the pleasure of peeling off with a spatula. Another tried to top him by telling of how he found his freezer full of exploded bottles of beer and liquor. Having to clean up the filth of the previous resident upon moving into a new apartment is a rite of passage of the expat in China. At least we don’t need to trouble ourselves with cleaning when we leave. Heaven forbid we cross that line. I guess we were lucky. All the foreigners teachers are housed together so we took over an apartment from the previous teachers at our school. Nothing really bad to clean out except normal dirtiness. Of course out west, it’s not really like the rest of China. When do you plan to hit the road exploring? May Holiday plans? Right on! That’s the way to go. Getting ready to start roaming pretty soon. It’s a little up in the air at this point as to when my daughter will begin school. She may be coming with me for the first trips out of Taizhou. Which would actually be pretty cool to go on some daddy/ daughter adventures. Thinking I would like to go out and visit Xinjiang in a couple months. Surprisingly, I moved into a clean – but old; read: crap kitchen + bathroom – apartment here in Hanghzhou … however it may have been cos it was rented via an agency. But when I rented in Taian directly from a landlord, then the flat needed cleaning … but nothing like the muck you describe. Happy cleaning 🙂 Maybe some beers while “working” miracles inside may lessen the woes. Thanks man! It’s all clean now and we’re moved in. This is probably the best place I’ve made a hub out of in a very long time. After the grime was removed and I could see what was underneath this place has just about every luxury I could imagine — including a washing machine! I feel like I entered the modern age here haha. I remember my Hangzhou apartments. The one with the puke I didn’t even bother cleaning: I just put some cardboard over the puke and forgot about it. Good to hear you fared better than I in that regard.